I’ve been loving on eggs lately. I can’t seem to get enough of the protein-packed goodness! From omelets and scrambles to quiches and hard-boiled eggs, it’s all been sounding mighty good to me! 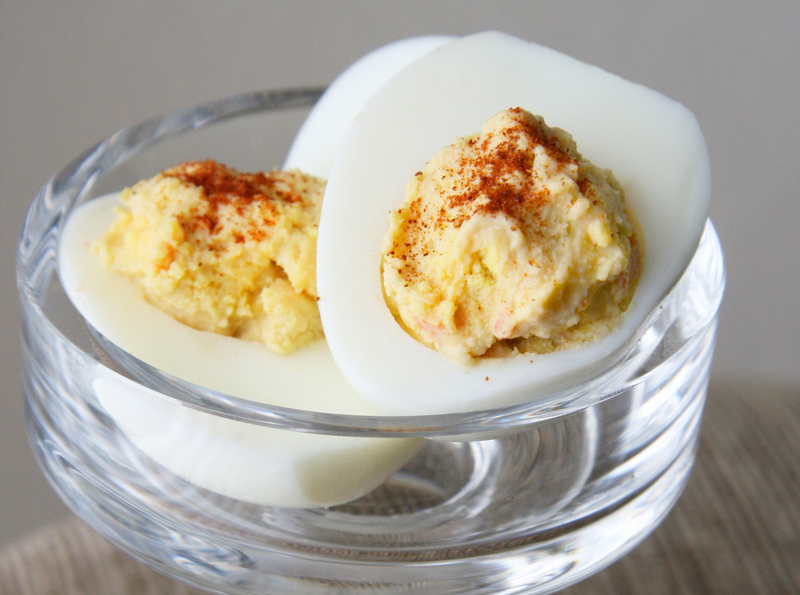 As a child, I remember eating deviled eggs at Easter brunch and dinners but I was never a huge fan. Let’s just say I’ve turned a corner and am definitely enjoying my fair share of these 2-bite snacks! I love hummus and I love eggs, so why not put the two together? This combo eliminates the mayonnaise (for all you mayo-haters out there) and simplifies the dish with a healthy twist. This dish is flexible to suit your preferences – make as large or small a batch as desired, change up the flavor of hummus, top the eggs with different spices or even seeds (parsley, cumin, smoked paprika, sesame seeds, sunflower seeds, oregano). Personally, I think the yolks are the best part, but if you are anti-yolk, the egg whites would also be tasty just filled with a spoonful of hummus. 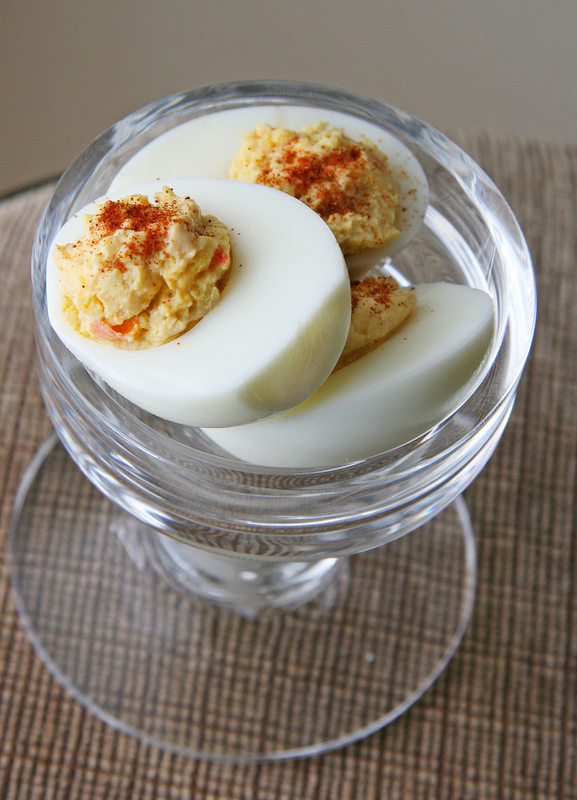 These eggs are quick to put together and are great as a snack, appetizer or part of your lunch! 1. Remove shell from hardboiled eggs and cut in half lengthwise. Carefully remove egg yolks and place in a small bowl. Mash yolks thoroughly until well combined. 2. Add 2 Tbsp of hummus per yolk used, mash and stir until creamy. 3. Fill egg whites with yolk/hummus mixture to create a heaping mound. Sprinkle with paprika, if desired. *Recipe Notes: A day before making deviled eggs, seal the carton of eggs with tape and place on its side in the refrigerator. This way, the yolk will remain in the center of the egg white so you have perfectly shaped and centered deviled eggs! For more useful tips on how to make hardboiled eggs, click here. This page has great information on how to boil eggs, from soft-cooked to hard-cooked. Nutrition Tid-bit: Eggs contain all the essential protein, minerals and vitamins, except for Vitamin C. The yolks are one of few foods that naturally contain Vitamin D (and I keep hearing about the prevalence of Vitamin-D deficiency!). Eggs contain choline, which helps stimulate brain development and function and preserve memory. Eggs also contains more lutein than spinach or other green vegetables, making eggs good for your eyes because lutein helps prevents age-related cataracts and muscular degeneration.